As a part of the beauty industry nail salons face severe competition and need to search out creative ways to draw in new customers. With more and more people spending money on their personal appearance, there’s no problem finding prospective clients, but it is getting quite challenging to convince them that your services are the best on the market. So how to expand your customer base? 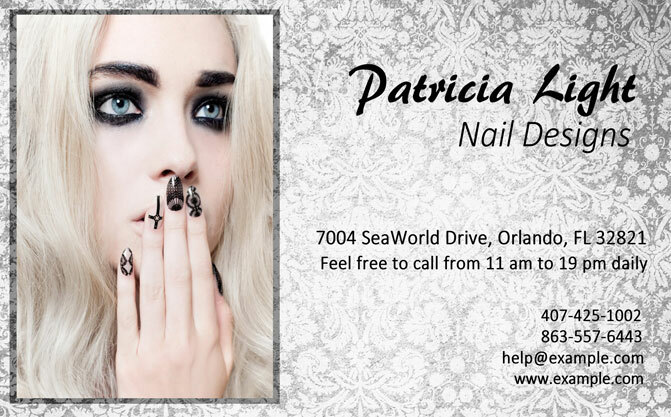 Making nail salon business cards is a no-fuss method to spread the word about your business and win the attention of new clients. The thing is to create eye-catching card designs that remain informative. If you are a self-employed nail technician or representative of a nail salon, you have probably faced this dilemma. When you think on your perfect business card you often find yourself between a rock and a hard place. How much contact information to include? What colors will attract customers and will not look too garish? If you feel overwhelmed with all the questions, you can contact print houses and pick some ready-made card template, but they will lack a personal touch and blend into one another. In this case, it is high time to design your own business cards! In order to create a pack of calling cards with your own hands, you will need a proper application that is easy to use. 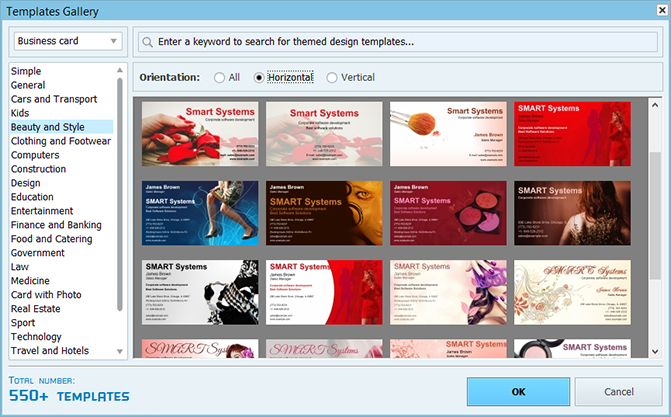 Business Card Maker is the best software for business card design as it offers more than 550 themed templates for all kinds of professionals, including beauticians and manicurists. With numerous editing tools and database capabilities, you will be able to make tons of business cards in a few clicks and print them right away. 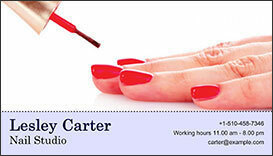 Below is a classy collection of well-designed business cards that are perfect for manicure and pedicure nails salons. Get inspired by these business card examples and promote your services in the best possible way! A well-designed business card is an effective marketing tool and a great way to expand your customer base. When it comes to choosing the main image for your card, it is vital to hit the mark. Perhaps a picture of a hand with nails beautifully polished will not surprise its receiver, but it will clearly state what kind of services you provide. Here a nice touch is to use the same color for nails in the background picture and the text caption displaying the salon name. Plus, the card offers two phone numbers, increasing the convenience for clients. Impactful and cleverly designed, this business card catches the eye of prospective customers with the striking graphics and strong brand treatment. Whoever gets this design into their hands will surely keep it thanks to an unusual background image and a beautiful combination of colors. 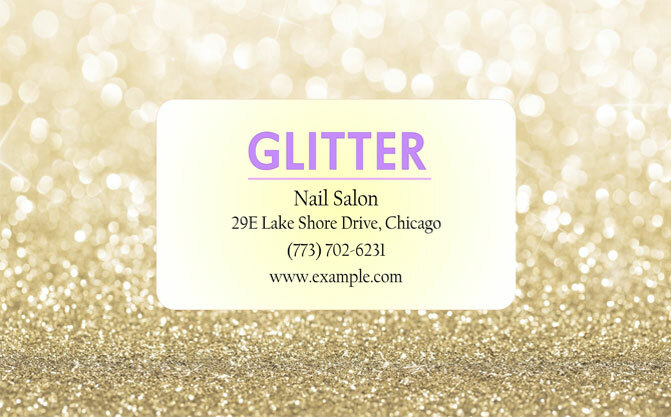 Golden-like glitter perfectly corresponds with the salon name and looks like shining nail polish. Light violet and rich yellow tones create an impression of a classy and glamorous salon. This business card will look even better if it is printed on thick paper. Since nail salons are made mainly for girls, there is nothing wrong with a card design that is pink and ‘girlish’. This thematic and attractive business card with clear communication seems to come from a Barbie world. 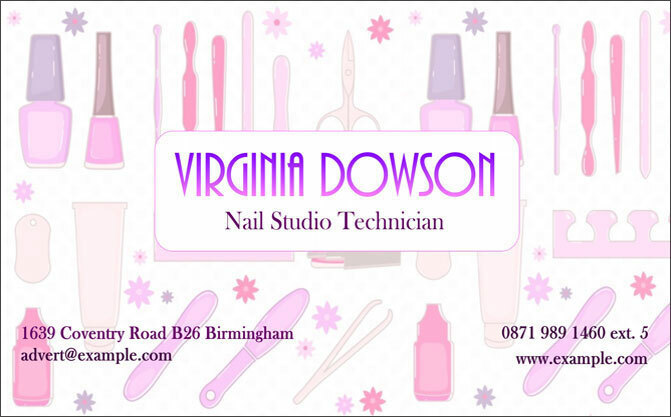 The background filled with cliparts of manicure sets is truly unique, the contact information stands out, and the paper is a soft pink shade. That, coupled with a stylish text font and its gradient fill, create a memorable and comforting image of the services the salon offers. In this case, the combination of black and white provides a simple but cohesive image for the nail salon. The background features floral embellishments that make the whole card design look rather vintage. The carefully chosen monochrome photo of a fashion model goes well with the overall color scheme. This card will be perfect for a beauty parlor that provides some other services apart from manicure, for example, make-up and hairstyling. However this business card is clearly a standout, it can also perform a double duty if it contains spaces for appointments on the back. This business card has an image-building visual that depicts nail tubes of different colors. Although it is a kind of picture you expect to see on the card of a nail technician, it still looks great. Prospective customers will like the way abstract polish bottles are seamlessly incorporated into the design. That way the visuals look like an inseparable part of the card and do not steal the viewer’s attention from the contact information. The nail technician’s name, address, phone numbers, email, website and working hours are favorably placed in a single corner so the card looks professionally designed. 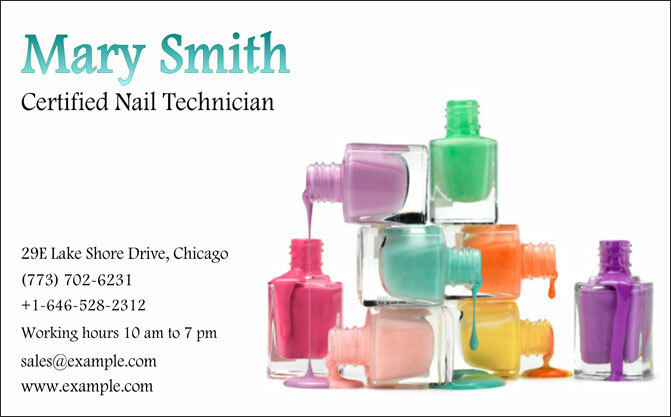 Nail salon business cards allow you to put your contacts right into your client’s hand and promote the services you provide. Since these cards are small and convenient, customers are more likely to keep them and share with friends instead of tossing them in the trash like they might do with flyers. What is more, if your card designs look great and clearly stand out from the rest, they will do real wonders when it comes to attracting new clients. So make sure to invest enough time and efforts into the creation of your professional business cards, and welcome those who want to decorate their nails!